Already providing nearly 50 percent of the world’s fish for human consumption, the fisheries and aquaculture industry will grow exponentially between now and 2050 to meet the nutritional demands of an expanding global population, which is expected to jump from 7 to 9 billion people during that same period. Establishing new fish farms particularly those found nearshore and very far offshore, is one way to support future demands, but today’s industry leaders also must look at ways of increasing productivity and efficiency, as well as reducing operating costs, of existing operations to meet future needs. 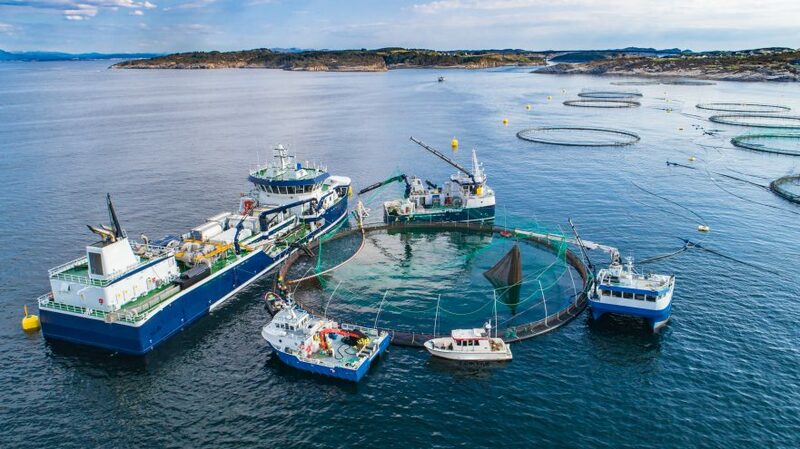 Most fish farms are reliant upon a critical network of workboats, which may include any combination of live fish carriers, tugboats, fish feed barges, crew transfer vessels, pontoon boats, platform supply vessels (PSVs), dredgers and other types of utility craft. While each is specialized in some way, the total fleet is generally targeted towards three primary activities: fish handling; infrastructure installation and deactivation; and maintenance, support and transfer activities. In most cases, these marine assets provide the only access to offshore fish farms and others located in remote areas. Workboats account for 20 percent of the total cost of aquaculture – a reality that can hinder companies’ ability to expand operations and increase yields. The good news is that innovative, new technology, specifically Sea Machines autonomous-command and remote-control products, can be installed aboard existing or new-build aquaculture boats to dramatically increase productivity, predictability, efficiency and safety. Read on to learn how. The workboats that transport and distribute live fish and feed, perform delousing treatments and perform all other fish handling tasks are ideal candidates for marine autonomy. With a Sea Machines system on board, vessel routes can be programmed to optimize transport or station-keeping (especially to deep-sea fish farming sites), ensure obstacle avoidance and reduce crewing requirements. These benefits save time and money, while increasing safety, and ultimately helping operators to be more productive and efficient. Operators looking to establish new farms will require towing and mooring support, marine anchoring and drilling, infrastructure construction and dredging. Each task will be performed by workboats, which can be optimized by autonomy. Pontoons and PSVs hauling out cage materials, construction supplies and fish-farming equipment benefit from programmed routes and plans. Multiple workboats can be programmed to work collaboratively while maintaining a set speed and distance. This multiplier effect is especially beneficial for routine work, such as the installation of mooring and anchor systems. Using autonomous systems, operators aboard a mothership can also control a second unmanned workboat, such as a tugboat or daughter-craft via remote control to reduce crewing costs. During deactivation phases, all the above capabilities apply, making decommissioning work more productive, efficient and safer. The majority of workboat costs are associated with the maintenance of farms. Once established, automated aquaculture workboats can optimize most routine tasks. Workboats using programmable routes and patterns to haul feed, monitor operation sites, clean nets and dredge the sea beds beneath farms can be tasked to operate in an unmanned autonomous configuration or via remote control. Sea Machines-enabled boats don’t require stop-work periods for crew shift changes or reduced nighttime operations. When operators’ boats are equipped with complimentary technology, such as thermal cameras, autonomous and unmanned workboats can operate 24/7, in nearly all sea states and conditions (ideal for offshore farms). Obstacle avoidance features also prevent costly on-site incidents that can damage cage systems and marine assets. The workboats that transfer personnel, such as feed barge operators and divers, similarly benefit from obstacle avoidance, collaborative and remote operations and more. Further, the programmed routes and station-keeping capabilities reduce operator fatigue, a major casualty factor in marine incidents during nighttime operations, long-distance transfers and challenging sea states. Sea Machines designed its products to work collaboratively with other remote-operated systems and on-board equipment that supports cage fish farming. These may include payload controls for marine equipment, such as winches and cranes, surface, underwater and thermal cameras; specialized sensors; and aquaculture monitoring systems. Such connectivity optimizes performance and data collection. Leaders in the fisheries and aquaculture industry are already starting to optimize their operations with autonomy. Those who take advantage of Sea Machines product will, in most cases, see return on investment realized within a year, thanks to increases productivity, predictability and efficiency. The Sea Machines SM300 or SM200 can be added to workboats as a retrofit or as part of new-build specifications, typically requiring only 10 components to install. Most vessels can be outfitted with a Sea Machines system in just a couple days. Even for small fleets, the system is surprisingly accessible, thanks to an affordable price point or flexible leasing options. These systems are designed to support fishery workboats in a wide range of coastal, harbor and offshore aquaculture activities and across all climates, from Arctic to tropical. Sea Machines ensures aquaculture fish-farming workboats perform at the most productive and efficient level, allowing operators to feed and grow fish. Upgrade your aquaculture operations by contacting Sea Machines today.